Today we have had a brilliant and exhausting day. We started with an exceptional buffet breakfast which served everything from bread rolls, to pastries, to sweeties, to chocolate cereal and eggs every way possible. The Mister ate his way though an impressive selection of different types of breakfasts. We then headed off to explore the streets of Istanbul. As expected it was heaving with people and got busier and busier as the day progressed. 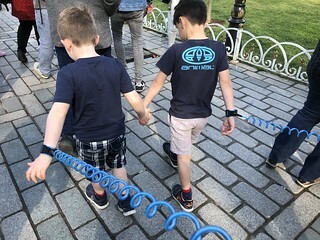 We had thought ahead though and had purchased useful wrist straps for the children – it might seem a little like overkill but we were grateful of the fact that it mean we could tether ourselves on child to one adult and to know that we couldn’t lose them! 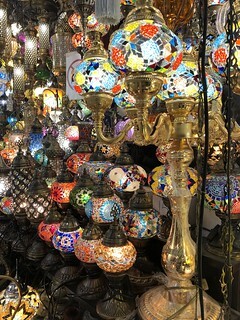 We headed for the Grand Bazaar – an absolute warren of shops and stalls selling jewelry, clothing, Turkish tat and any manner of other stuff. It was an amazing place, full of smells and sights that the children have never seen. The Little Miss has turned out to be s proper little tourist attraction! Her blonde curly hair means that the locals are fascinated by her and are often chucking her under the chin or touching her cheek. Twice today I have had complete strangers stop her her and take a selfie with her. It’s rather hilarious but also useful as stallholders were reducing their prices when she was with us! 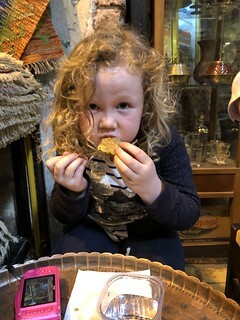 After that we went to the Spice Market – probably my favourite as I love buying spices and the sights of all the sweets like baklava and other dried fruit etc – it’s such a treat to see overthinking displayed so beautifully. We had lunch in the shadow of one of the mosques with the sounds of the call to prayer echoing around us. 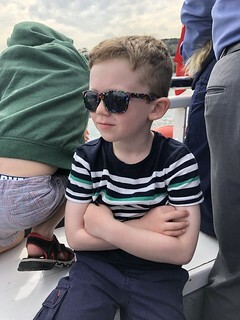 After lunch the kids were pretty tired so we took a 90 minute trip up the Bosphorous River. 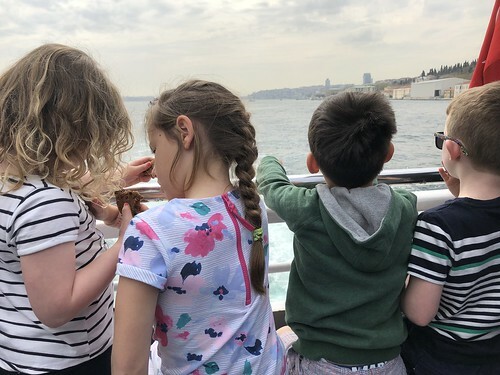 It was amazing how much fabulous architecture we could see from the river and on our return we walked over the Galata Bridge to the Asian side of Turkey before getting the tram back to near our hotel. Despite it being early we decided to go for dinner before we went to the hotel as the kids were flagging. It was a disaster. We went to what looks like a niceish restaurant that had an OK menu and we ordered a couple of pizzas and 4 different types of kebabs and chips and some drinks. Two bottled of water arrived and then we waited and waited. Finally two pizzas arrived, brazenly delivered to the booth at the back in a pizza takeaway box before being slid onto plates by the useless waiting staff. Five minutes later to kebabs and chips arrives on plates covered in cling film from another establishment elsewhere. We never received the other food and never received the drinks. Emma channeled her teacher persona and gave the waiter a loads of grief in English before giving him enough money for what we had received and leaving. We then headed to the hotel where we bought more food and drank wine. 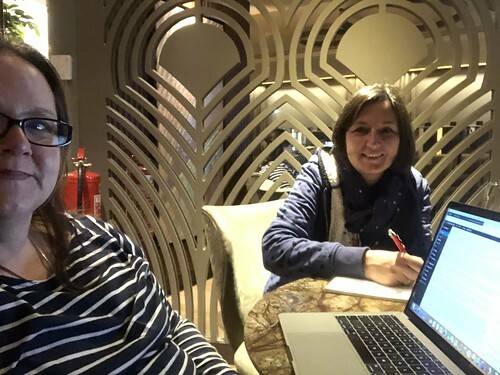 Emma and I are now sitting in companionable silence in the bar, drinking wine; me writing my blog and she writing her travel journal about our splendid day. 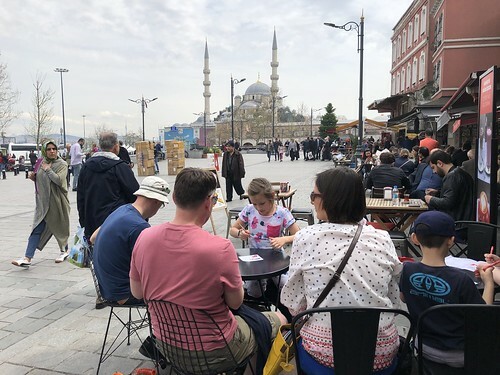 Istanbul is a delight.